Mexico is a leading producer of silver, providing about 20% of international silver production. The country’s large silver and gold deposits have made Mexico a prestigious precious metal source for a long time. La Casa de Moneda de México, also known as the Mexican Mint, was established in 1535 by Spanish decree, and since then has produced only stunning gold and silver coins, such as the famous Centenario gold coin. The first coins minted by this prominent mint were the Mexican Peso and the Spanish dollar, called Eight-Real (8 releases), with the latter considered to be the basis of many modern national currencies, including the United States dollar. Today, La Casa de Moneda’s original minting production houses the Mexican National Cultural Museum, and the mint has moved to another facility in San Luis Potosi. 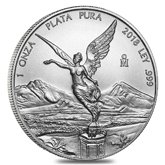 In addition to circulating coins, the Mexican Mint also manufactures commemorative and bullion coins, such as the Silver Mexican Libertad – among the most impressive of the Mexican Silver Coins. 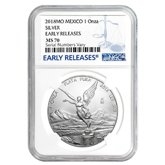 This beautiful Mexican silver coin was first issued in 1982 from 1 troy ounce of .999 fine silver. Due to its huge popularity among collectors and investors around the world, the Mexican Mint decided to expand its size range and introduced several new sizes in 1991. This superb silver coin is a rendition of the Centenario, minted between 1921 and 1947. The obverse of this coin depicts winged Victoria (as seen on the Mexican Independence Victory Column in Mexico City) against a background of Popocatépetl and Iztaccíhuatl. These two volcanoes are the basis of a mythological love story between the warrior Popocatépetl and the ancient princess Iztaccíhuatl. The reverse side showcases the Mexican National Coat of Arms – a golden eagle perched on a cactus while holding a snake in its beak. On the standard 1 troy ounce coin, the image is surrounded by the 10 historical coat of arms. The coin’s spectacular design and attachment to history make it a treasured addition to any portfolio or collection. If you have questions about the Mexican Silver Libertad, please contact our customer service associates at 800.852.6884. You can also submit your questions by email at info@bullionexchanges.com, or connect with us via our online live web chat feature.